Part 1 takes place in a Bokashi bin. You keep your food waste in it, sprinkle some Bokashi brand, keep it airtight, and repeat until the bucket is pretty much full. Then you set the whole thing aside for a couple of weeks. Meantime, you harvest the nutritious Bokashi juice to fertilize your plants (diluted 1:100 with water) or pour down your drains, full strength. Part 2 of Bokashi ocmposting is burying the pre-compost (what you have in your bucket two weeks after you fill it and leave it alone) in soil. You wait at least one week. After that, your fermented food waste should have broken down into soil, mostly unrecognizable. A very important thing you need to remember when burying your Bokashi pre-compost is to first mix it with a small amount of soil before covering everything up with at least 4 inches of dirt. The rule of thumb to remember is to make sure every piece of scrap food is in contact with at least a small amount of soil. I forgot about this and, as a result, it took much longer for me to “harvest” my Bokashi compost soil, and ended up having to do more work than necessary. Last Winter, being unable to bury my Bokashi pre-compost in the ground, I decided to try making a soil factory in a plastic bin, as described here. I bought the largest, covered bin I could find in Walmart. Set it in a corner of the garage, and began dumping the contents of my Bokashi buckets into it. Problem was, I forgot to mix the pre-compost with some soil. I simply dumped more soil on top of the blocks of fermented food waste. When I returned to my soil factory in the Spring, I found that it had stunk up my entire garage. There was moisture in the container. And when I dug around, the Bokashi pre-compost was unchanged. They were blocks of pre-composted food waste, unchanged from the time I buried them. Ugh. Then I went back and read as much as I could about Bokashi and realized – duh – I had forgotten about mixing the Bokashi pre-compost with soil FIRST. So I took my trowel and dug around the bin. I must have had at least four buckets worth of pre-compost in there. The grass clippings I added in early Spring had all but disappeared, but the fermented food was still very much intact. I made sure this time to mix everything up with the purchased top soil, potting mix from old planters, and an orchid I killed through over-watering. Where the mixture seemed too wet, I added handsful of Bokashi bran. I also put a couple of layers of newspaper on top of everything to help absorb the moisture. The smell has dissipated and now I’m hoping to get usable compost in the next week or so. If you’re just getting started with Bokashi composting, remember this important lesson: mix the pre-compost thoroughly with soil BEFORE covering everything up. Luckily with Bokashi, it’s hard to completely mess up. Even if the food waste ends up rotting instead of fermenting, you can just bury everything under the ground and let nature take care of it. In my case, I hope I wasn’t too late. We’ll see in a few days. 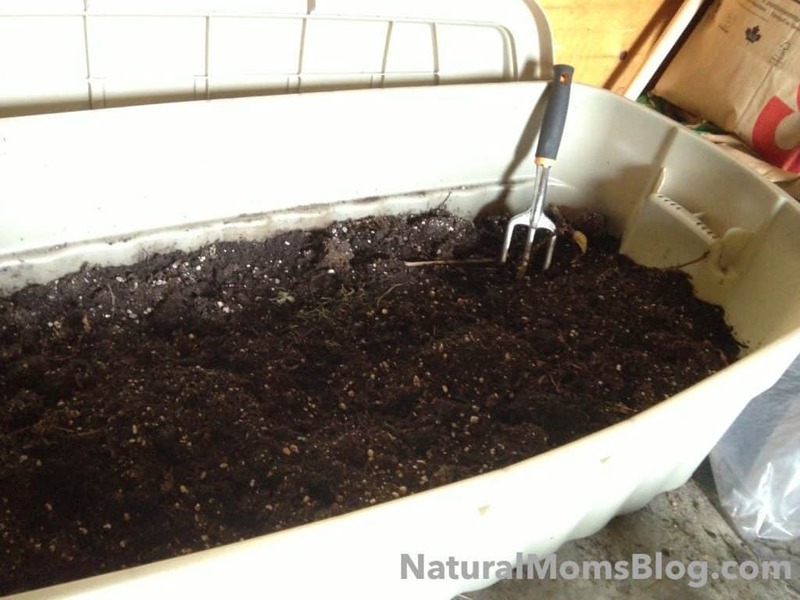 Have you tried Bokashi composting? What challenges have you had with it? How did you overcome them? Share in the comments below.